During 191,8 the German Supreme Command informed Kaiser Wilhelm II (the German Commander-in-Chief) that the military situation was hopeless and that they should accept the demands of US President Woodrow Wilson for a ceasefire. The Treaty of Versailles (French: Traité de Versailles) was the most important of the peace treaties that brought World War I to an end. The Treaty ended the state of war between Germany and the Allied Powers. It was signed on 28 June 1919 in Versailles, exactly five years after the assassination of Archduke Franz Ferdinand. The other Central Powers on the German side of World War I signed separate treaties. A mutiny began amongst German sailors who didn't want to risk their lives believing the war was nearing its end and on 9th November Kaiser Wilhelm II was forced to abdicate. The Armistice agreement to end the fighting on the Western Front was signed in a railway carriage in Compiègne Forest at 5am on 11th November 1918, to come into effect at 11am. This occasion is sometimes referred to as "the eleventh (hour) of the eleventh (day) of the eleventh (month)". Immediate removal of all German troops from France, Belgium, Luxembourg, and Alsace-Lorraine. Surrender of materiel: 5,000 cannons, 25,000 machine guns, 3,000 minenwerfers (a type of machine gun), 1,700 airplanes, 5,000 locomotive engines, and 150,000 railcars. By the end of the war 22,477,500 Allies and 16,403,000 from the Central Powers (of Germany, Austria-Hungary, Bulgaria and the Ottoman Empire/modern-day Turkey) had been: killed, wounded or missing in action. Many memorials were built at sites where major battles had taken place. 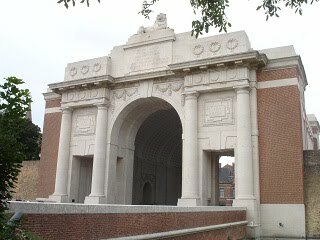 The Menin Gate in Ypres, Belgium, for example, is dedicated to the British and Commonwealth soldiers who were killed in the surrounding area and whose graves are unknown. Every year in Britain, ceremonies begun taking place at war memorials across the country on Remembrance Sunday to remember those men who fought in the Great War. 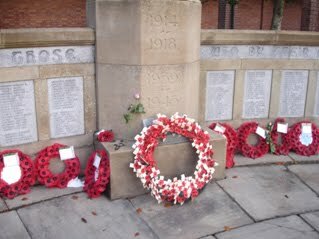 A two minute silence takes place and wreaths of poppies (the only flower that would grow on the battlefields when the war had ended) are laid.